Never lose your wallet, purse or phone again with Tile Slim — the world’s thinnest bluetooth tracker. Tile Slim is the easiest, quickest and most reliable way to find your wallet, phone and more. As thin as two credit cards, you can slide, tuck or attach Tile Slim to anything! Attach it to your notebook, laptop, or Kindle. Slip it into a tight spot like your wallet or jacket pocket. Then, use our simple app to make it ring or see the last place you had it. If it’s your phone you’re looking for, simply press your Tile Slim to make your phone ring — even if it’s on silent. 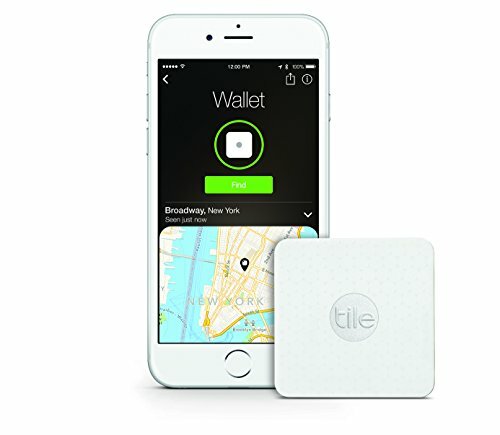 With over 5 million Tile devices sold, the Tile community is the world’s largest lost and found network. Supported Apple Devices using iOS 8.1 and up: iPhone (Released 2011 or later): 4s, 5, 5c, 5s, 6, 6 Plus, 6s and 6s Plus iPad (Released 2012 or later): 3rd Gen, 4th Gen, Air iPad Mini, iPod Touch Apple Watch. Supported Android Devices using 4.4 or higher (KitKat or Lollipop): OnePlus One, Samsung Galaxy S5*, S6*, Samsung Note 4*, Note 5*, HTC One*, HTC One M8*, LG Nexus 4*, 5*, 6*. Compatibility:iOS: iPhone (Released 2011 or later), iPad (Released 2012 or later), iPad Mini iPod Touch, Apple Watch ,Android: Android: Samsung Galaxy (S5 or later), Samsung Note (4 or later), Nexus (4 or later), OnePlus (one or later), HTC one (M8 or later), Motorola Moto X, and most Android devices equipped with Android 4.4 (Kitkat) or later and Bluetooth 4.0 or later. *IMPORTANT* - Please be advised that Tile’s connectivity and app are affected by a known Bluetooth issue with devices using Android 6.0.0 (Marshmallow). Connectivity appears to be fixed in Android 6.0.1. Google has already begun to release 6.0.1, so please be sure to upgrade your OS as soon as it's available for your device. Thank you! Use your smartphone to make your Tile Slim ring when it's nearby but out of sight.